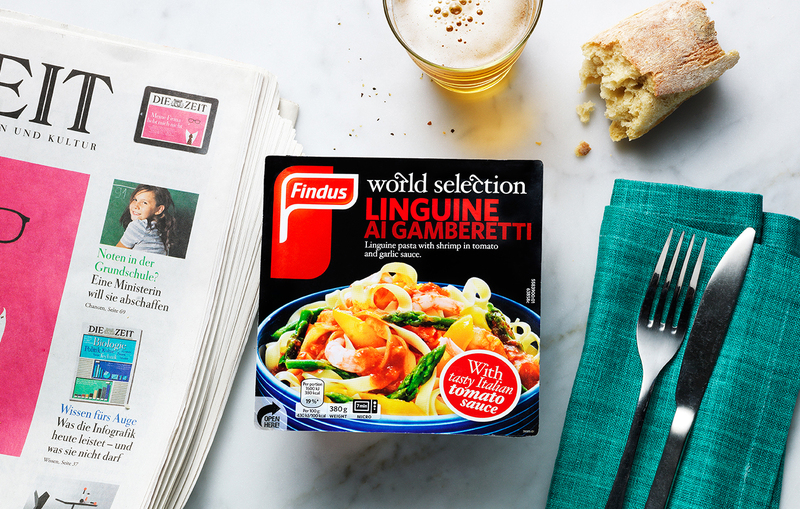 Findus is the market leader within the frozen food category with long heritage in the Nordic region. Products in Findus substantial portfolio include ready meals, fish, vegetable, baking products and more, with a true icon in the frozen Ebba-pea. Findus is a part of the Nomad Foods group with a global reach and a number of frozen food brands. The frozen food category is under pressure. Fresh products are perceived as better, tastier, and more natural than frozen food. In addition, private labels are competing for consumers’ share of pocket. Although freezing helps preserve flavour, freshness, quality and nutrients, the challenge is to help convince consumers that frozen products actually deliver both quality and taste. Findus’ former packaging weren’t doing a good enough job of communicating the products’ superior quality, freshness, sustainability and nutritional value. With focus on quality and taste, we developed two slightly different approaches. For vegetables, the idea was to focus on their naturalness, beauty and quality. The design shows the vegetables just as they are, against a natural background and with a genuine and authentic look. Quality was highlighted by origin and type. In the fish category, our design principle was to inspire consumers to enjoy the high culinary quality of the fish and make it easy to understand how to prepare it. From a brand perspective we created a visual brand block to clearly define Findus’ market leadership role.